Maximize your freezer space with the Ice Cube Bin. It provides a deep opening for holding ice cubes in the freezer. 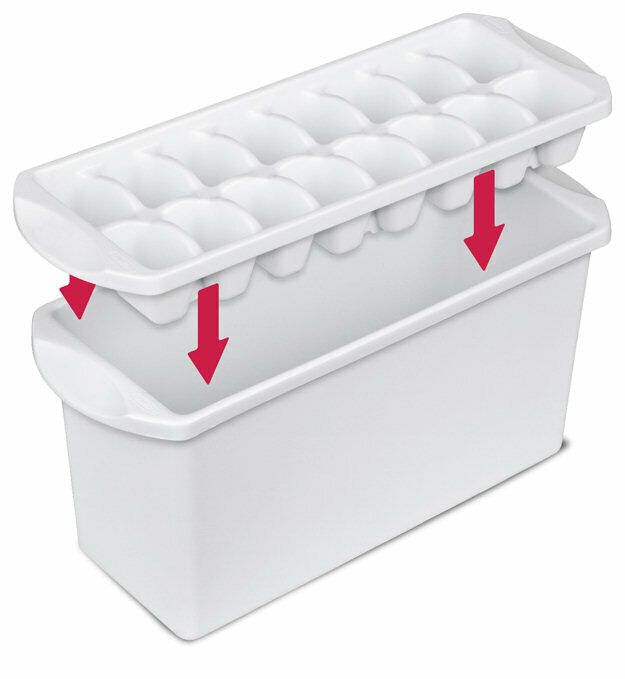 The opening of the bin is appropriately-sized for the Stacking Ice Cube Tray (item #7240) to stack on top. The narrow design saves space and can also be used to organize foods within your freezer. It is also perfect for storing any of your frozen fruits, vegetables, meats, cheeses and more. 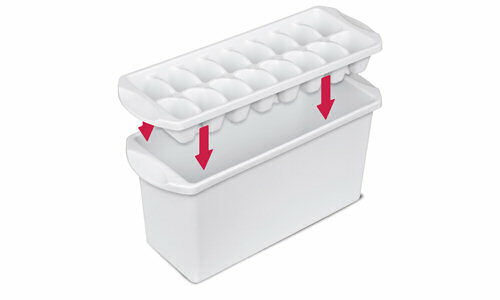 This ice cube bin features two integrated handles for easy removal from the fridge or freezer. The Ice Cube Bin is dishwasher safe, as well as BPA-free and phthalate-free. 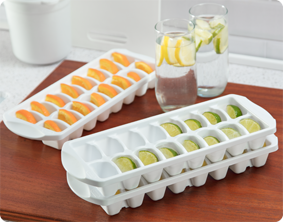 The overall dimensions of this item are 13 1/4" L x 5 1/8" W x 6" H.
Overall Assembled Size: 13 1/4" x 5 1/8" x 6"
The Stacking Ice Cube Tray stacks neatly on top of the Ice Cube Bin to save space in the freezer while making and storing larger quantities of ice. Ice Cube Bin is rated 4.5 out of 5 by 2. Rated 5 out of 5 by MellowMary from Teachers - These Are Great For Classroom Book Boxes!!! I have purchased over thirty of these boxes for my elementary classroom. They are excellent for individual student book boxes. I don't like how typical book boxes sold for classroom use are slanted - lower in front and higher in back - like a magazine holder. These are much easier for kids to carry and hold than the other style, so fewer book spills and less damage to the bins and books. These bins can be cleaned easily with a melamine sponge after the kids have dirtied them. Clear packing tape sticks well to the plastic but also removes quickly, so I can change name labels when needed without scarring the surface. The tape has always come off cleanly without leaving residue - a definite plus. In my opinion, these bins are the best classroom book boxes you can buy! Rated 4 out of 5 by vegasbob007 from Very useful product Should have the same model about 2-3 inches shorter .